A waft of frigid mist drifts across the splintered wooden crosses, cloaking their detail, and a shiver ripples through my arms and down my back as I watch their shapes fade threateningly back to life. They were erected as memorials to the backpackers and locals who have plummeted to their death, and the abyss lies just a few feet from where I’m standing. 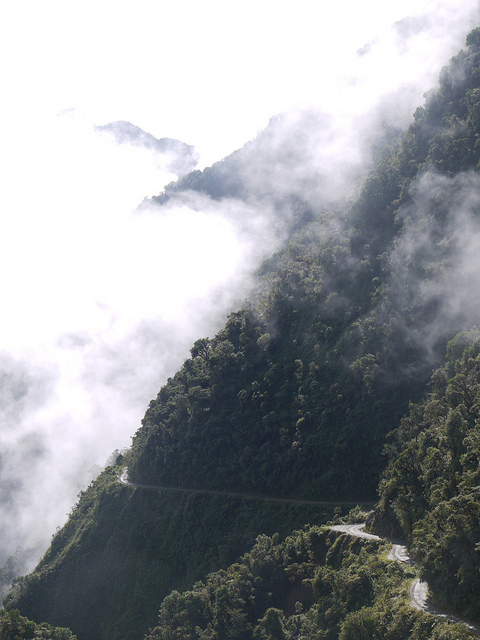 On first consideration it might seem surprising that people still die whilst cycling the North Yungas Road in Bolivia, a road eagerly referred to by its more popular and dread-inducing monikor – El Camino de la Muerte, Spanish for ‘The Death Road’. If a person were going to be a little more careful than usual, I reason, surely it would be at a location in which ‘Death’ was half the title. But, teeth chattering in the sub zero bite of 4700 metres above sea level at the very start of this now infamous freewheel, I change my mind. The name it seems is just an invitation to push the boundaries of good sense and later bath in the glory of having nearly died, but not. This truth emerges as I catch glimpses of the fired up faces of the bikers, creased and flushed with surging adrenaline, as they rocket down the unsealed track next to a chiasmic drop which flanks the Death Road for most of its course, the reason behind all the crosses and the well-deserved reputation. I’m here on my loaded touring bike, cleats detached for this ride, and in the midst of a throng of bikers who have opted instead to join an organised tour. In all seventeen companies now sprinkle the Death Road with bikes and riders and the setting is as staggering as the premise of riding it. Cut into the jungle-clad mountains of the Yungas, just one hour from Bolivia’s most populous city of La Paz, the foreboding rock-strewn track twists an almost continuous descent for over forty miles. Whilst rallying down over three and a half thousand vertical metres, riders travel not only from altitude to lowland but from cloud filled cold to humid tropical heat and from unsullied fear to, fingers crossed, celebration and relief. After peering tentatively over the unguarded road’s edge and briefly marveling at the sheer cliff face and remote tree tops beneath, I wonder whether the Paraguayan prisoners of war who constructed this road in the 1930s had any inkling at the time of its eventual fate. 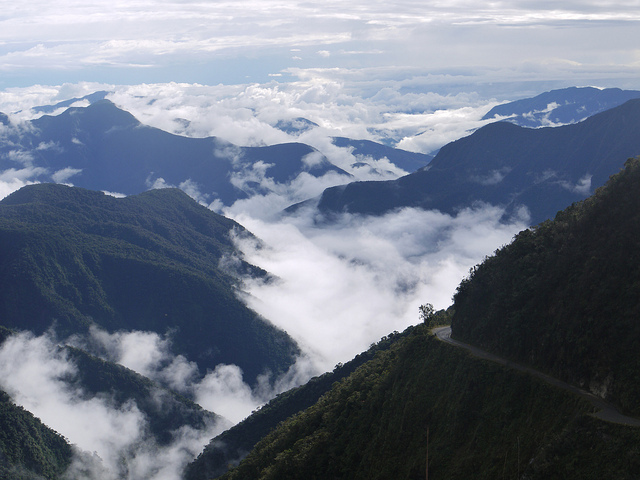 Over the years the Death Road has claimed thousands of lives and is now a feared and notorious but popular attraction along the deeply rutted Gringo Trail of South America. Inside the hostels of La Paz myths concerning the Death Road abound. A car flying over the edge only one week ago was the current star of the rumour mill, batted around mostly by a bunch of Israelis just back from a tour, one nursing a broken wrist after he had thrown himself from his wayward bike before it had thrown him into the jungle. To find out some hard facts, I decide to ask the experts. ‘The risks are very real. And this road is not the place to cut corners.’ Proclaims Derren Patterson of Gravity, the company home to the original posse of guides who dreamt up the ride back in 1998 and who still boast an unrivalled safety record. ‘The interest for most companies is to sell the tour as cheaply as possible because cheap backpackers often only look at the price tag without thinking that in Bolivia there are no standards for activities like this.’ Cut corners, it emerges, come in the shape of re-welded frames, underpaid guides, cheap parts and even fake brake pads. Researching the road’s murky past only led me to further question my decision to join these thrill junkies. The Death Road was the site of Bolivia’s biggest road accident when, in 1983, a bus carrying over one hundred passengers hurtled over the precipice and tumbled into oblivion. By the mid-90s it was official once it was christened The World’s Most Dangerous Road following a review by the Inter-American Development Bank who estimated that 200 to 300 people careered off its edge every year and that, per mile, there were more fatalities here than on any other road on earth. Not long after this unsavory honour was bestowed on the North Yungas Road guides and backpackers arrived in force, keen for a slap of adrenaline and a photo on Facebook, complete with a boastful caption. By 2006 the riders had it almost all to themselves once the construction of a new thoroughfare to the jungle was completed, taking with it most of the traffic. Amongst the cyclists who have dared not all have reached the small town of Coroico near the finish line. In the last twelve years eighteen “I survived The World’s Most Dangerous Road” t-shirts have gone spare. It’s near the top of the descent that resides the most hair-raising section. At this altitude clouds frequently invade the forest, obscuring both the three metre wide sliver of rugged terrain ahead and the vertiginous drop immediately beside it. I watch as the wind drives dense whirls of cloud into the foliage to reveal an exaggerated and menacing vista, tempting and deterring the gathered riders about to take the plunge. Rows of impossibly deep Vs made up of converging mountainsides stretch away, becoming ever more blurred by a distant and sullen murk. Jungle hugs every bulge and whim of the mountains; beneath the cliffs it hides the twisted and rusting metal carcasses of hundreds of trucks and cars. As well as the magic of the precipice, it’s exhilarating too being so enclosed in nature. 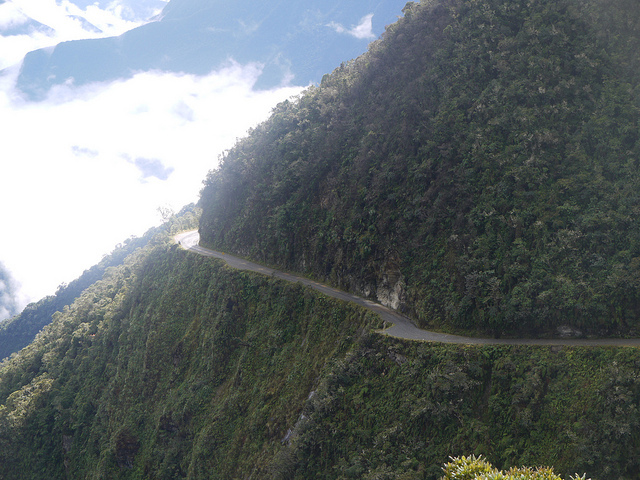 As I begin the descent an internal monologue kicks up, a perhaps predictable “DEATH road… be careful!” on repeat. But soon another voice takes over, going something like “YEAAAAAAH! I’m riding the DEATH road! WOOOOOOOOH!” My enthusiasm though is soon subdued as I begin wobbling wildly in the aftermath of a collision between my front tyre and a fist sized chunk of rock. I pull swiftly over to the right as a fleet of Konas and their hooting jockeys rampage past, each sensibly screaming “Coming left!” as they go. As a one day aspiring father I start to wish that I too had suspension. Throughout these upper reaches water patters onto the rocky road surface from high above, only the truly courageous, skillful or imbecilic veer to avoid getting wet; I am none of the above and receive a sopping for my cowardice. After each hairy switchback another huge curl of terror-inducing trail reveals itself along with one very clear impression – roads do not belong here. The soundtrack of the Yungas doesn’t seem to fit with the chilling vista, a timid and quirky blend of squawks, buzzes and clicks attest to the richness of life that lurks in the nearby greenery. Underneath and barely discernible there’s another layer of sound – the trickle and gush of hidden jungle streams. At times it’s tempting to wonder at the scenery, to glance behind, to search for the source of that strange jungle sound, and then the inner voice shouts ‘DEATH ROAD!’ and I reign in my curiosity and refocus my attention on my juddering bicycle and the ever present peril to my left. Today, I remind myself, I’m careful. Every so often someone is going to do their best impression of ET going home and I have promised my mum I will not be the next abyss-bound silhouette. At one of the viewing points en route I skid to a halt and begin chatting to a gaggle of hyperventilating but for now stationary bikers and as I discover, The Death Road draws all sorts. ‘My son challenged me to give it a go!’ a pudgy middle aged man confides with a nervous grin, now bathed in perspiration and perhaps questioning the wisdom of accepting a dare from a sixteen year old. Roughly twenty five thousand riders enjoy the buzz and bragging rights every year, from masters of downhill to slack fast food junkies and from multinational gangs of backpackers to honeymooning couples, competing for glory. The tour groups issue their riders with elbow pads and helmets, as we clamber back onto bikes I can’t help but consider what the protective kit and their human contents would look like after a hundred metre free fall and a jungle canopy crash-landing, but to avoid an embarrassing panic attack, I try hard not to. Behind a van trails our group of riders so that the guides can assist in case of accident, or get a front seat view if one of their clients flies a short cut to the finishing altitude. Towards the lower reaches I relax a little more and gravity spins my wheels ever faster. The temperature rises, clouds evaporate, multi-hued butterflies dance beneath my handlebars and fetching purple flowers and banana plantations fill my peripheral vision. Then all of a sudden I’m coasting through a village and towards a rumbling river, above birds of prey glide languorously in low loops and Bolivia welcomes me back from the edge of reason with beaming children and ogling women festooned in bowler hats and traditional pollera skirts of shocking pink. I spot the father of the teenager, his face now as iridescent as the skirts but also alight with jubilation. I exhale my relief knowing that I too have made it, although I’m concerned for my brake pads, they are now at death’s door. The bikers swiftly pile into town and just as rapidly into bars where they high five and down celebratory beers. Others pull wheelies but most don’t feel the need to show off any more than donning their “I survived…” t-shirts. A quick body count by a guide confirms that, this time, everyone gets one. There’s a subset of cyclists who enjoy climbs, I’m one of them, and from the off my inner masochist wasn’t entirely happy with the prospect of spinning downhill for hours. Where’s the payback? I needed to know. Where the pain to go with the gain? Fortunately for the guilty, the Death Road has another currency – you pay for the freewheeling with fear and there’s now no doubt in my mind – it’s more than a fair price. But of course for the vast majority the Death Road will fail to fulfill its eponymous promise, in fact for me the opposite was true and I finished the ride not just giddy with relief, but fiercely alive. They could change the title, somehow though, I don’t think it would have quite the same draw. 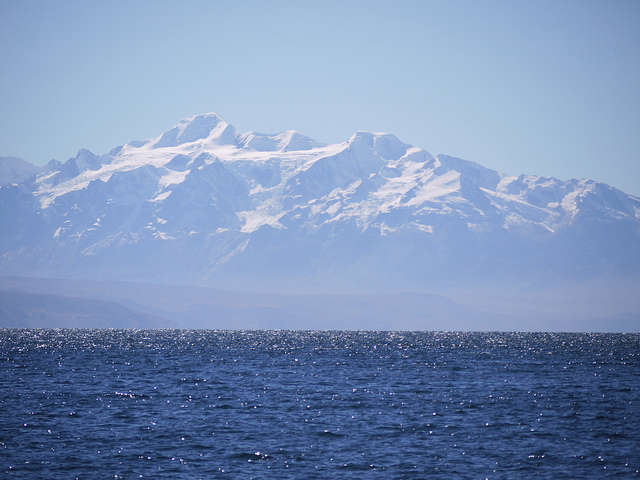 After escaping the action of La Paz I headed west to the shores of Lake Titicaca, the largest lake in South America and the highest lake of it’s size in the world at a lofty 3812 metres above sea level. The road around the lake holds me tight to it’s shore, often just a few faded green fields melting into the lake water lie between us. Further out, amongst the passive blue ripples, rise the giant mounds of islands that from a distance resemble the humps of huge sea monsters frozen in time. Beyond the islands, and the invisible opposing shore, hover snowy mountain tops, their bases lost in a grey-blue blur which hangs mysteriously over the lake. Copacabana is another popular stop on the Gringo Trail, a ‘path’ that I swore to abandon once I had made it as far as Cusco in Peru. A wave of drug dealers, gangs of Israelis revelling in their post army exodus, overly assertive restaurant touts and chocolate selling hippies surge through the cobbled streets. I sniff out the cheapest hostel in town and set about trying to repair my only boots which have a jagged gash which now reveals half the sole. South Americans have much smaller feet and finding replacements my size has been impossible. Tomorrow I want to escape the masses and trek across Sun Island. 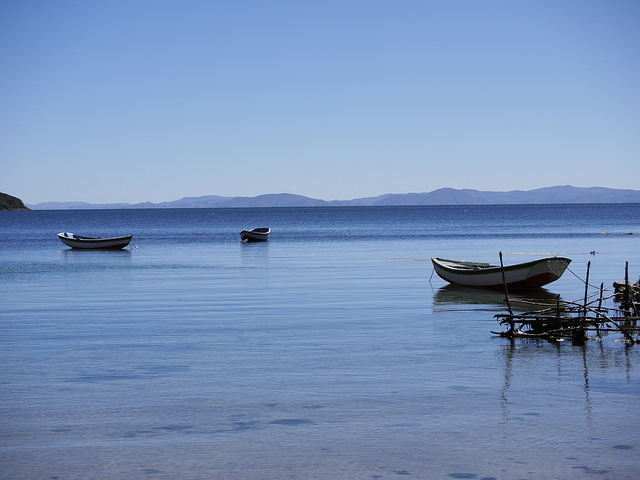 The tree scattered hills behind Copacabana slowly deflate behind the frothy, parabolic wake of our boat and the expanding blue of Lake Titicaca. I sit hunched up, hugging my knees to my chest and shivering on the open top deck of a boat heading for Sun Island, one of the lake’s largest and famed for the array of Inca ruins pockmarking the rocky terrain. I am engulfed in different languages, I recognise German, Hebrew, Spanish, French and Portuguese. Amongst the assembled tourists is a German chewing coca leaf and a couple of French tourists who have embraced Bolivian culture to the extent that they are adorned in the loud colours of the traditional knit-wear. I smile secretly to myself as I imagine them wondering into the arrivals terminal at some major European airport, still festooned in the traditional garbs, perhaps also with alpaca fleece coats and pan pipes. We chug along beside the southern end of the island. The choppy, tight undulations of the terrain have a wave-like quality, the land seems like an elevated, drab version of the lake itself. Spiky succulents sprout out of the rocky slopes and shore side wooden fishing boats break into a wobbly dance as they meet the churning wake of our craft. We walk from the beaches up the rocky path with a guide who has a crooked toothless grin and a cow boy style hat, as large black and white birds of prey patrol the sky above. 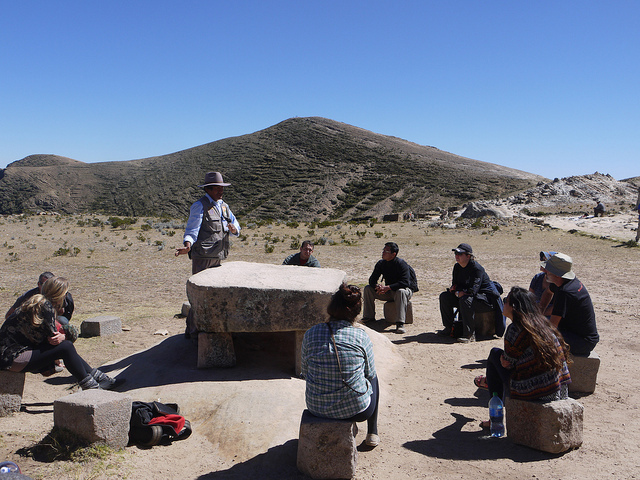 He takes us to an alter, the original sacrificial table used by the Incas when they killed virgins on special ceremonies. He talks us through the presumed details of the brutal process, the murder and subsequent removal of the heart. To demonstrate he raises a clawed hand enclosing the imaginary heart fresh from the virgin’s chest, the circle of gasping tourists fix excited and appalled eyes on the hand. Afterwards I set off with Coni, a Swizz girl I met on the boat. For three hours we walk the path as it arcs and dips over the rolling spine of the island, the dark blue view of the lake never escapes my eye line. As I amble past terraced fields and watch the gulls gliding from lake to shore, I admire the tranquillity of the setting, impressed that it’s now a world away from the violent and dramatic distant past we have been privy to. The train seemed the most time-conservative way to reach Machu Picchu. I take a seat opposite an American couple from Colorado who chat away in that relaxed and familiar way that Americans have when they strike up conversation with strangers. A little later an older American lady sits down next to me, a conversational non-sequitur who rambles through topics, from the people she has met with very large feet to what happens to horses when they get a cold. The train tracks coddle the bank of the Urubamba river, frothy and eye-catching. With the passing minutes the forest grows thicker, trees overhang the far river bank, their creepers and vines dangling into the water like a congregation of still and pensive fishermen. The train finally stops at Agua Calientes and I step onto a platform full of jostling, confused tourists and hotel porters. Crowded buses make runs up the hill to Machu Picchu but I feel a little guilty about taking the train instead of the trekking option so decide to redeem myself by hiking for an hour uphill to reach it. In the morning heat it’s a sweaty battle up, but when I emerge from the jungle foliage and Machu Picchu shouts it’s presence, I stop dead and appreciate the enormous landscape which is swimming in sunlight and throngs of sightseers. The feeling is akin to walking onto a stage and the curtain being drawn to reveal the audience because surrounding the ruins runs a huge circle of the blunt, verdant cones of even grander mountains. After joining the shuffling hoards, and trying to covertly listen to knowledgeable tour guides, I make it back to Agua Calientes where I am chuffed to catch up with Tom, a good friend from my time in Liverpool, along with his wife Thea and her parents. That night the town is alive with outlandish costumes, noisy drunks and dancing backpackers. The occasion is a saint’s day, although as I have learnt of late, the Peruvians will take any excuse for a fiesta. 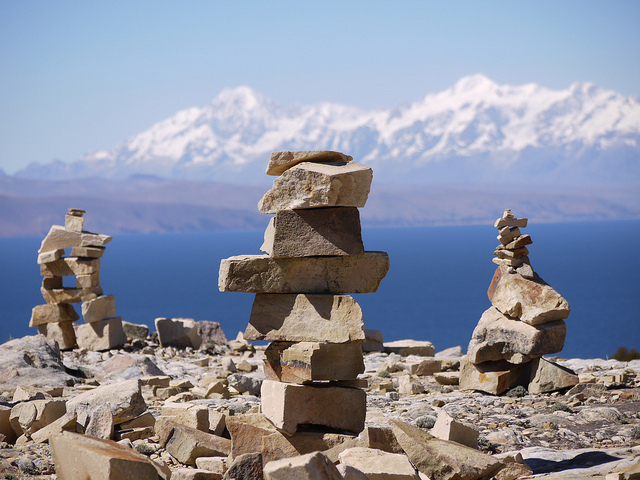 So in contrast to my usual type of blog piece, this month I decided to write three short pieces about popular tourist activities in Bolivia and Peru. For the next post expect my more usual tales of adventure from a remote part of Peru as I cycle one of the toughest routes so far, taking in over five passes each in excess of 5000 metres altitude and hitting some notoriously bad roads on which I will climb higher in one week than from sea level to the summit of Mount Everest. Once through the central highlands I’ll join the coast and scoot along to Lima where I plan to visit projects looking at TB control in the shanty towns around the capital as well as a project which is focused on the eradication of tapeworm infection. I will report back next month. That looks so incredible!! Good luck on your next leg of the journey. Still enjoying your terrific blogs stephen. Looking forward to next one ! Always inspiring Steve. Ride on, ride on! Incredible journey, mate, feels like we're riding right along there with you. Cheers! Thank you for teaching me a couple (many) words today!